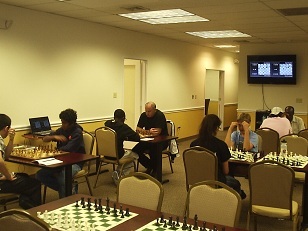 Twelve players competed in three separate quads at the CCFC this past Friday. The top section was extremely competitive with three masters and expert Alex Eydelman. NM Kapil Chandran had a good night defeating NM Daniel Lowinger, Eydelman and drawing with NM Joshua Colas. Colas also defeated Lowinger and Eydelman and in the end shared first place with Chandran. Meanwhile, in the second quad, CCFC Director Melvin Patrick continued on his streak and surpassed 1800 for the first time! Patrick went undefeated, only ceding one draw to Guy Colas. Finally, in the third section, Al Pinto entered as the favorite. However, two unknown high schoolers playing in the first tournament also joined. Ultimately they all traded points to make a large three way tie for first!